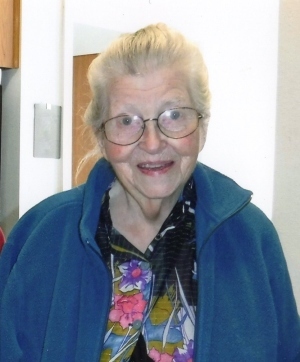 A memorial service for Mary Rose Jones, 88, of Coos Bay, will be held at 10 a.m., Feb. 23, at Charleston Community Church, 90402 Metcalf Drive in Charleston. Private cremation rites were held at Ocean View Memory Gardens in Coos Bay. Inurnment will be held at a later date at Sunset Memorial Park in Coos Bay. Mary was born Dec. 7, 1929 in North Bend, to Herbert Edward and Rosella (Smith) Moore. She passed away Feb. 7, 2019 in Coos Bay. Mary was lucky enough to have lived her entire life in Coos County. In 1949, she married Marvin Jones and they were happily married for 50 years, until his passing in 1999. She was a longtime Sunday school teacher and also served in the Charleston Fire Department Auxiliary. She was loved by many and will be deeply missed. Mary is survived by her sons, Douglas Jones and wife, Tina of Coos Bay, David Jones and wife, Karen of Bandon, Daryl Jones and wife, Tamera of Maine, and Donald Jones; grandchildren, Tristan Jones of Coos Bay, Justin Jones of Eugene, Kevin and wife, Darla Jones of Roseburg, Mike Jones of California, Melissa and husband, James McKethan of Tacoma, Wash., Sean and wife, Tessa Williams of Snohomish, Wash., and Jeremy Williams of Everett, Wash.; 11 great-grandchildren; 8 great-great-grandchildren; sister, Helen Cruckshank of Coos Bay; brothers, James Moore of Charleston, and Tony Moore of Fox Island, Wash.; as well as 6 nieces and nephews. She was preceded in death by her parents; and husband, Marvin Jones. Memorial contributions under Mary’s name may be made to the Charleston Community Church, 90402 Metcalf Drive, Charleston, OR 97420.